There are a few reasons why people turn to the internet to ask a question about pecan tree leaves, from descriptions of the leaves to find out what those funny lumps or marks are – or even whether the fallen leaves are okay to mulch. The pecan is the state tree for Texas and it’s also popular among gardeners; provided the conditions are right they will give you a generous crop of the buttery nuts for which they are famed. Hailing originally from Mexico and the southeastern to southcentral USA, they require hot, humid summers and very well drained soil. With a tendency to reach heights of around 100 feet they are not suited to small domestic gardens, and they don’t play well with other plants. If you plant one yourself or find one in your new garden, make sure it’s kept a good distance from the rest of your greenery. This for two reasons; the leaves themselves carry a toxin called Juglone which is also present in many other nut trees. This is poisonous to a good many plants, and as pecans are considered ‘messy’ trees they contribute a good amount of litter from both the leaves and the flowers. Pecans are not self-pollinating, so unless a neighbor has pecans too then you will need to ensure you have trees that flower in the right order. This might sound unusual, but the tree will produce both sexes of flower throughout the year. In order for the tree to fruit you need one tree that bears male flowers first and one that bears female flowers first. In this way they can be pollinated by bees and insects. A good plant supplier will be able to advise you, when purchasing, which two trees you will need. Given their propensity to take up a lot of space you should allow at least 50 feet between trees, so they really are not ideal for small yards. Pecans are highly prized among nut lovers so it’s not uncommon to move homes, find yourself with a new garden full of interesting plants and realize one looks suspiciously like a pecan. This might mean some extra yard work for you but, if you look after it properly, at some point in the future it is going to bear these lovely nuts. So how do you identify pecan tree leaves? The pecan is a species of hickory and so is a broadleaf tree. It has distinctive flat compound leaves. This means that rather than one large flat leaf, there are multiple leaflets grouped together along the end of the stem. The pecan tree bears between nine and 17 of the these leaflets, with an even number placed directly opposite one another travelling along the edges of the stem and one single terminal leaflet at the very end. These stems of leaflets grow alternately along the branch, rather than symmetrically as the leaflets themselves do. Although the term ‘broadleaf’ might suggest large flat leaves, these are instead finger-like with pointed tips and gently serrated edges. They are always at least three inches long, so if the leaves do not match any of these descriptions it definitely is not a pecan. 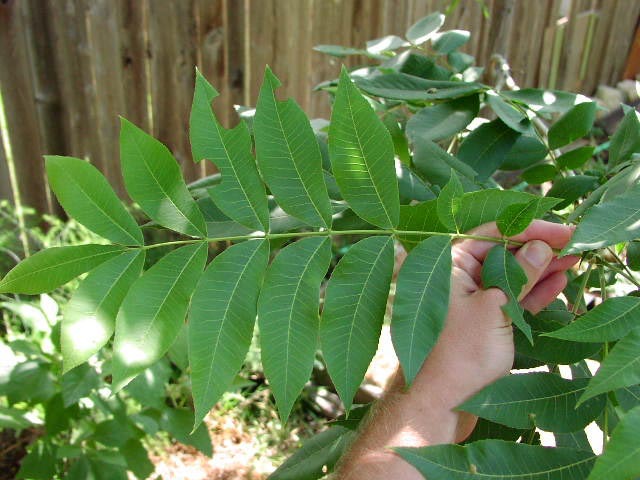 A common reason for asking about pecan tree leaves is disease. Although these are tough trees they are very appealing to parasites, especially the pecan weevil, an insect which likes the sweet nuts just as much as we do. These small bugs appear in late summer, burying their eggs into the soft outer shell of the young fruits. When they hatch, the larvae gorge themselves on your lovely young nuts, before exiting the (now empty) shell through a tiny hole. They drop to the ground to burrow into the soil, before emerging as adults to start the process again. Adult pecan weevils also feed on the soft young kernels, piercing the outer skin to get to the insides. Although this serves as a wonderful meal for them it starts a process that sees the kernels blackening, then falling off the tree, and makes them inedible for humans. As pecan weevils live in the ground there are a few simple things you can do before having to resort to chemicals. Sticky bands can be purchased that wrap around the trunk of the tree, making it difficult for the weevil to climb up to the pecans. Placing sheeting beneath the tree enables you to catch the falling bugs as they emerge from the shells. Check the sheeting daily, and kill any you find to prevent them starting the cycle again. The aim is to reduce the number of adults over time so their impact lessens. If you have a serious infestation, and the tree is sizeable, the most effective solution is to call in professionals who are trained to deal with large trees. If you find web-like structures arching across the leaves then don’t think you have some kind of nut-loving spider. It is more likely to be tent caterpillars, so named for the shape of the web they create. If left alone these caterpillars can cause a lot of damage to the leaves, stripping large areas bare. When you spot these silky tents the best solution is to remove the whole stem of leaflets and dispose of it in a way that kills the caterpillar. A common method is to burn the stem. Perhaps a less common concern, and one that particularly affects grafted trees, is pecan scab. If you find dark green or even black spots on the young leaves of the tree, then this could be your problem. There is little else you can do but seek advice on fungicide, as the pecan scab will spread to the fruits unless you eradicate it. Again, professional help should always be sought for larger trees. If your climate is right with hot, humid summers, your ground is well drained and you have plenty of space then don’t be put off by any of the above issues; these long lived trees – they can survive for up to 300 years – will bring more joy than hassle. And don’t forget the delicious nuts! I do appreciate the simple descriptions. I have a fig tree growing into the pecan tree and under it. I just moved to this house and am discovering trees, etc. I don’t recognize or question. Now that I am sure about what is what, I can decide what to do. The fig tree has small figs on it so no question there. I wonder if you have a method for killing a vine called locally “Virginia creeper.” It is covering most of the bushes and even some trees. I plan to brush Round-up on the leaves. Is there anything else I can do? They are almost as bad as kudzu.